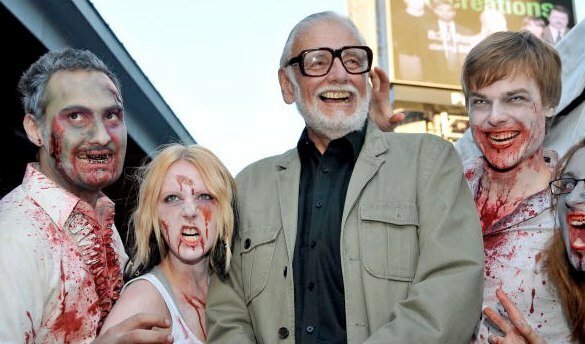 Forget viruses, meteors or rabid monkeys, George A. Romero created the modern zombie. His vision of hordes of rotting, shambling, flesh-hungry corpses has permeated culture to an insane degree. Beginning with 1968’s Night of the Living Dead, Romero thrilled and terrified audiences while simultaneously delivering a satisfying social criticism. His apocalyptic perspective reached its zenith in all-time classic Dawn of the Dead, in which he perfectly skewered contemporary consumerism and a load of torsos. But from there it’s a case of gradually diminishing returns. Day of the Dead has a lot of interesting ideas but is a bit structureless, Land of the Dead is clever but forgettable, and so on through Diary of the Dead and Survival of the Dead, both of which are just a bit boring. And now we have another upcoming ‘of the Dead’ sequel – Road of the Dead. Or to give it its full title, George A. Romero Presents: Road of the Dead. This one isn’t actually directed by Romero – he’s merely credited as co-writer – but it features zombie prisoners competing in NASCAR-style races as a kind of undead bloodsport to amuse rich spectators. The idea is the brainchild (and directorial debut) of Matt Birman, who did second-unit work on Romero’s last three zombie films. At least as far as I can see it, this one’s got stinker written all over. Not only does it feel as if they’re cashing in on the Romero brand name, but quite frankly, the idea of zombies driving race cars sounds really dumb. I’ll grant that it’s at least original though, and I’m certainly ready to be proved wrong. No word on a potential release date just yet, but we’ll let you know more about Road of the Dead as soon as we hear it.